Asia-Pacific, especially China, shines the brightest in 2018 for the coffee roaster. In this weather, a warm brew in hand is the hottest of tickets. Increasingly, that's delivered by Starbucks Corp. (SBUX - Get Report) , which has over 27,000 stores worldwide, including a thriving presence in the Asia-Pacific, especially in China, where the company foresees brisk growth this year. The coffee roaster has been in the region since 1996, first in Japan, and in China for 18 years. But even as the company posts about 7% comparable store sales growth in the region, it will likely need to continue to open stores at a rapid clip — last year, the company added 550 net new stores in China bringing the total up to 3,000 stores there in 135 cities — as margins in China tend to be lower. On average, margins there are lower than in the U.S., Benjamin Lau, chief investment officer of Apriem Advisors told The Street, 24% versus 27%. Lau said Starbucks will try to lift those Chinese margins with a saturation of stores that sell innovative drinks and high-end products. In December, Starbucks expanded its footprint in the region when it debuted in Shanghai a Roastery, the company's java superstore that is effectively a shrine to coffee, the drinking of the brew and an ace calling card for the brand. In its 30,000-square-foot space is a two-story copper cask, covered with more than 1,000 traditional Chinese chops, or stamps, hand-engraved to tell the story of Starbucks and coffee. Beans are roasted onsite and drinks are pricey. No matter, the formula is a winner for customers who sometimes linger for four hours plus. Shanghai also more than 600 Starbucks stores. To bolster its Chinese connection further, last year, Starbucks bought out two Chinese joint venture partners, Uni-President Enterprises Corporation and President Chain Store Corporation, for $1.3 billion. That deal gave Starbucks outright ownership of 1,300 stores in Shanghai and Jiangsu and Zhejiang provinces and control over the stores. "[Starbucks is] becoming more of a global company, and China is going to be an increasing part of that growth," Guggenheim Partners analyst Matthew DiFrisco told TheStreet on Wednesday, Dec. 20. "More and more will come from China, less in the U.S. The baton is being handed to international, namely China and Asia, to contribute more to top-line growth." In 2018, the Asia-Pacific region will drive over half of Starbucks' global store growth of 1,100, with 600 in China alone. In the Asia Pacific, there are nearly 7,500 stores now. "In Q4 alone, the China/Asia Pacific region led growth with revenues hitting $860 million, up 14% after adjusting 4 points for foreign exchange," Starbucks CFO Scott Maw said during the Q4 November earnings call. Starbucks is "signaling that they may be ramping up" Asian growth in 2018, added DiFrisco. Starbucks CEO and President Kevin Johnson also highlighted the region in the November call: "China was a standout in fiscal 2017, posting 7% comp growth, strong revenue growth and another year of average unit volumes and strong profitability." Here's what else is coming for Starbucks in 2018. Tech, tech and more tech. "They have been ahead of curve and have a strong presence with mobile order and pay," said DiFrisco. Some 13.3 million customers are enrolled My Starbucks Rewards, and they represent a third of all sales, a program that also offers a free coffee each time their spend amounts to $62, said DiFrisco. Starbucks wants to get you in and out of stores as quickly as possible. Last fall Starbucks continued its rollout of the cloud-based Digital Flywheel program, backed by artificial intelligence (AI). Through it, the chain's regulars find their every java wish ready to be fulfilled and food and drink choices are suggested. The targeted tech gives customers product selections based on their profile, preferences and location and even the day's weather. "Starbucks is one of the best companies in the world that connects brand, user and consumer experience between digital mobile and the real world," Brian Solis, principal analyst and futurist at Altimeter, told TheStreet in an interview. "They are still pushing forward, rolling out their Digital Flywheel strategy to be more dynamic to further integrate digital and real world." 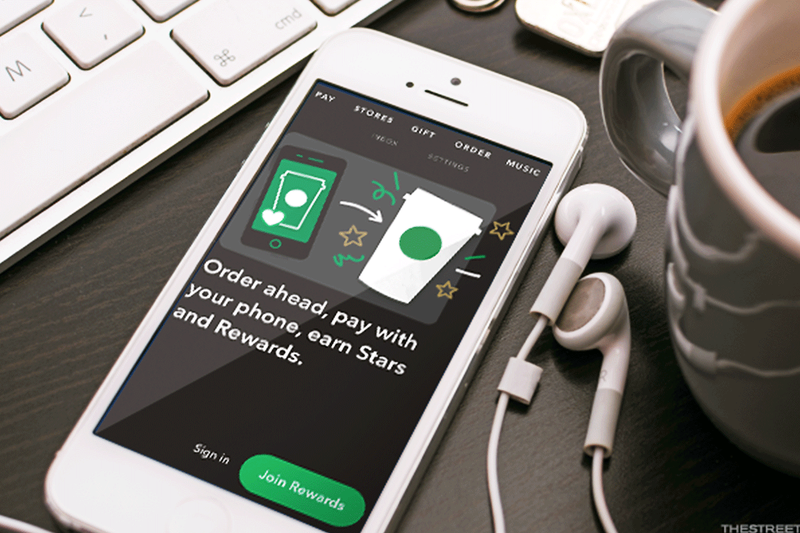 The My Starbucks Rewards program relies on customers to maintain a credit balance, which the company is changing to encourage more purchases, added DiFrisco. Enter co-branded Visa cards in partnership with Chase, part of JPMorgan Chase & Co. (JPM - Get Report) , for U.S. customers this winter, one is a credit card, followed by the other, a debit, and both allow customers to wrack up Starbucks Rewards.